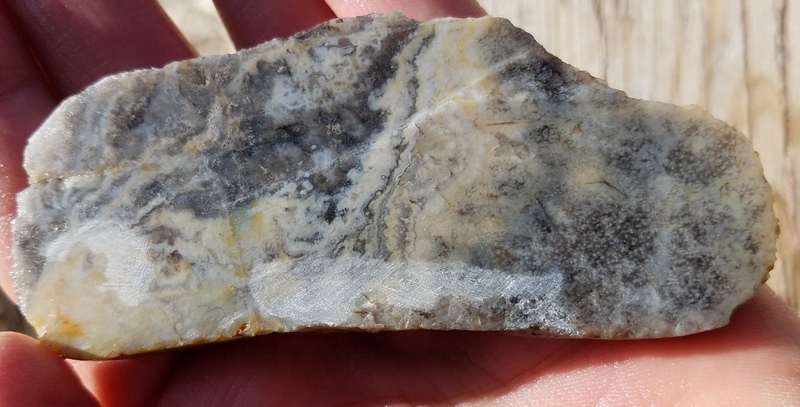 Here's a prairie agate with some definite possibilities. I still have a big chunk of the rock left so I'm hoping to get some more decent cuts. Haven't decided what I like best- rockhounding, tumbling or cutting what I've collected. So far I think it's rockhounding but they all have their surprises...and disappointments. Either way I sure am enjoying it all. A very nice one. Great patterns. Looking forward to seeing what you make of it! Thanks. Someone I work with thinks that there would be a market for locally collected agates (especially prairie agates) that have been made into jewelry. Something like that is a long way off for me but it bears consideration. We get a lot of tourists through this area and I've been working with businesses here for almost 21 years so I'm sure that if I ever get to that point I would have a retail opportunity here in town. And no one else here is doing it that I'm aware of, so that's a good thing. But like I said that's a loooong way off. For now I'll just do the things I'm enjoying and keep learning. 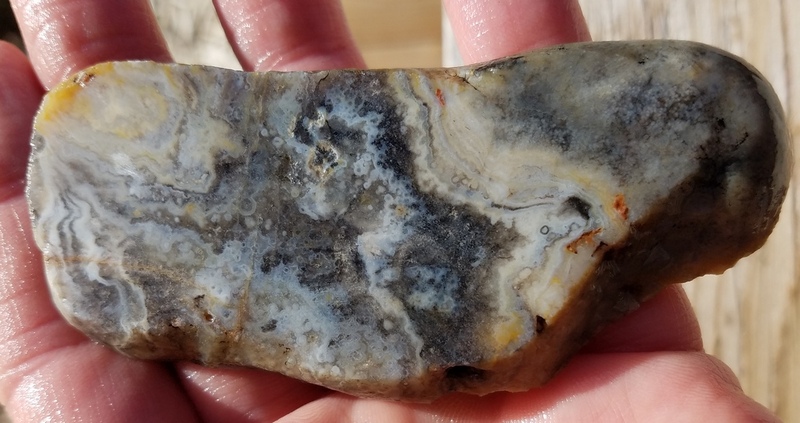 I like to write, so I keep notes and journals in my shop for rocks, equipment and other goodies..
Now in Oregon, I have a yard art pile and a go back to pile of material... Hahaha.. Everyone has their own thoughts on what material looks good to them and their likes.. (I like that). I think you will be making jewelry in no time. Rock specimens can also sell to tourists. Nice! That almost has Crazy Lace like patterns in it. That's the key word, almost. I love Crazy Lace someday I might just have to get some.